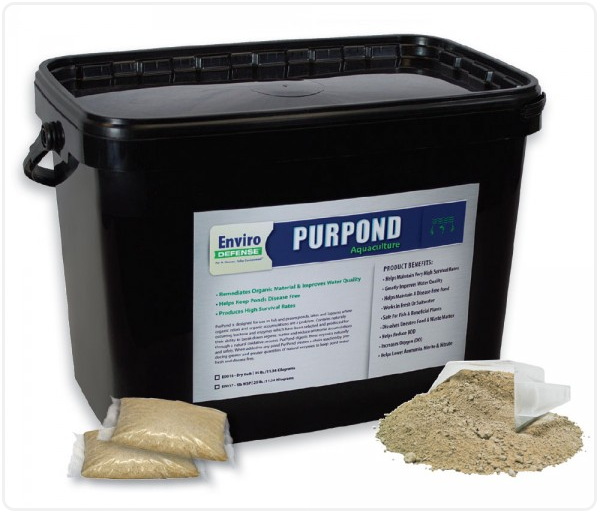 EnviroDEFENSE® PurPond Aquaculture is designed for use in fish and prawn ponds, lakes and lagoons where organic odors and organic accumulations are a problem. Contains naturally occurring bacteria and enzymes, which have been selected and produced for their ability to break down organic matter and reduce ammonia accumulations through a natural oxidative process. EnviroDEFENSE® PurPond Aquaculture digests these organics naturally and safely and keeps pond water fresh and disease free. In 1997, a comprehensive study was performed in the Philippines and Thailand at various shrimp farms to test the efficacy of EnviroDEFENSE® PurPond against regional competitors. The white paper presentation was delivered at the 1997 World Aquaculture Conference in Seattle, WA – Title: Efficacy of the Three Brands of Probiotics in Enhancing and Maintaining Optimum Physio-Chemical and Biological Parameters in Ponds Stocked with Black Tiger Shrimp at 40 OSM. (The testing was overseen by an official with SEAFDEC). To determine which among the three brands of probiotics was the most effective at enhancing and maintaining optimum physio-chemical and biological parameters of shrimp rearing environments. To identify which of the three probiotic brands was the most economical to use in culture operations. To develop the most appropriate method of administering probiotic materials in ponds. To be able to incorporate efficient use of probiotics into the research company’s protocol.